No Smoking, Or ... ? Not that I want to, in fact I've never even tried it, but you really can't smoke anywhere in New York City. My favorite sandwich shop, around the corner from my office, has a decal on the wall reminding you that you're not allowed a cigarette. Every time I'm in there waiting for my decadent hot delicious sandwich, I ponder the sign. 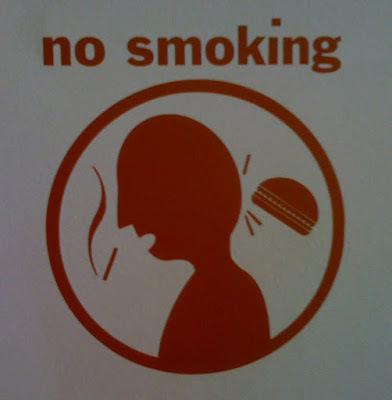 What I think it means is, if you light up, someone will hit you in the head with a hamburger. But the thing is? They don't sell hamburgers. I think it means that bald people can't smoke or else fake teeth will come knock them in the head. as former smokers, all those smokers out in the street in NYC just made us want to start again, or knock them in the head with a ... yeah, I still don't know. I thought it was a flying saucer of some sort. Judging by your description of what they do sell, nobody is going to throw that. So a McD hamburger? or a plastic one that they keep on hand just for that occasion? Cause I think the picture indicates that the hit has occurred, knocking the cig out of the poor shmuck's mouth, but also causing the hamburger to reflect away from the shmuck's head and fully retain its perfectly hamburger-shaped profile. What? You think too much time on my hands? Or an overactive imagination? I thought it suggested that smoking would inspire such fearsome coughs that one's too-small hat would fly off one's head. Is that Pac Man behind bald geriatric toothless dude? Or a tentacle-less jellyfish? Perhaps it is a tin of chaw. LOL. They just might have a secret hamburger chucker WAITING in the wings for SOMEONE to light up. I dare ya. Kinda makes you wanna try just to see wtf will happen, huh? I bet you wish that one day someone would smoke in there so you could throw your sandwich at their head. That would be awesome. I suppose people will be so outraged that they will leave the premises to buy a hamburger to throw. who would throw their "hot delicious sandwich" that surely cost a fortune? NO, they grab a cheap burger from the nearest fast food joint and let it harden in their bag until the opportunity arises and then "wham" to the back of someone's head. I need to try this outside the Starbucks near where I work--they have a great outisde setup and all the old men play chess and smoke. You need a gas mask to navigate the sidewalk. I thought it meant if you smoke God will knock your hand-knitted yarmulke off of your head. Go figure. Now see, this almost makes me want to light up, just to see what kind of adventure awaits when I do. That is very, very funny. There must be a Flickr group or some thing devoted to hilarious signage, no? this honestly made me laugh out loud for three minutes straight. my baby is sitting here in her high chair staring at me like i'm crazy. i tried explaining it to her but she's ten months old. she doesn't get it. I look at that and all I can think of is Flying Spaghetti Monster. Flying Cheesburger is a lesser demigod in the FSM pantheon, and is not only the patron saint of nonsmokers, but good dental hygeine. Right?